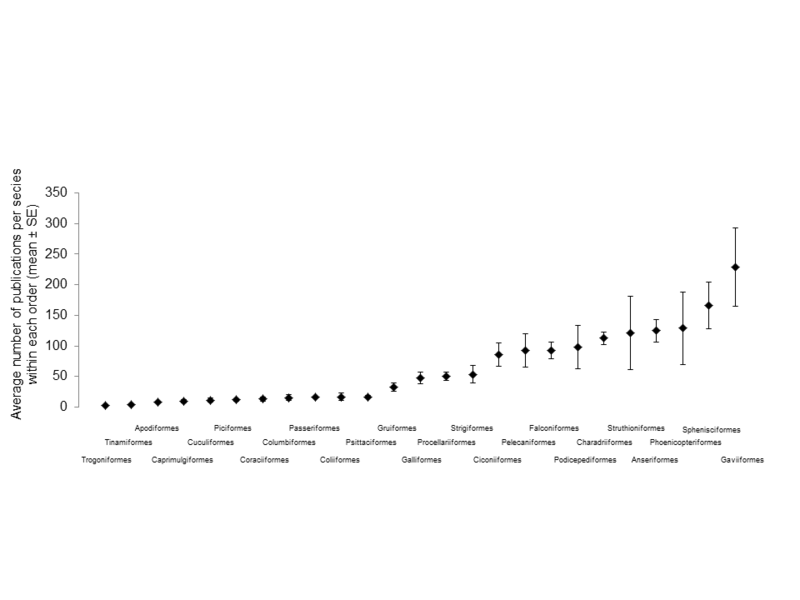 Compilation of publication data in bird species to identify taxonomic bias. Between species differences in research effort can lead to biases in our global view of evolution, ecology and conservation. The increase in meta-taxonomic comparative analyses on birds underlines the need to better address how research effort is distributed in this class. Methods have been developed to choose which species should be studied to obtain unbiased comparative data sets, but a precise and global knowledge of research effort is required to be able to properly apply them. We address this issue by providing a data set of research effort (number of papers from 1978 to 2008 in the Zoological Record database) estimates for the 10 064 species of birds. We then test whether research effort is associated with phylogeny, geography and eleven different life history and ecological traits. We show that phylogeny accounts for a large proportion of the variance, while geographic range and all the tested traits are also significant contributors to research effort variance. We identify avian taxa that are under- and over-studied and address the importance of research effort biases in evaluating vulnerability to extinction, with non-threatened species studied twice as much as threatened ones. Our research effort data set covering the entire class Aves provides a tool for researchers to incorporate this potential confounding variable in comparative analyses. TABLE 2: Research effort and species number in the different orders, ranked in alphabetic order. Taken together, our results show that research effort is not randomly distributed among the 10 000 plus species of birds and that all life history and ecological variables examined here show statistically robust (most with p<0.001) research effort differences. In addition, the phylogenetic position of a species and the order, family and genus in which it is classified predicts a large proportion of the variance in the research effort devoted to it, with little effect of recent changes in taxonomic nomenclature. These results are not surprising, as random variation in research effort would be difficult to achieve given the logistic constraints imposed by some habitats and geographic areas. Our study does not aim at correcting the methodological issues related to research effort trends, but rather at describing them and making the data available to other researchers. This is a significant compilation of bird research publication data covering all of the 10,064 bird species on the IUCN list. 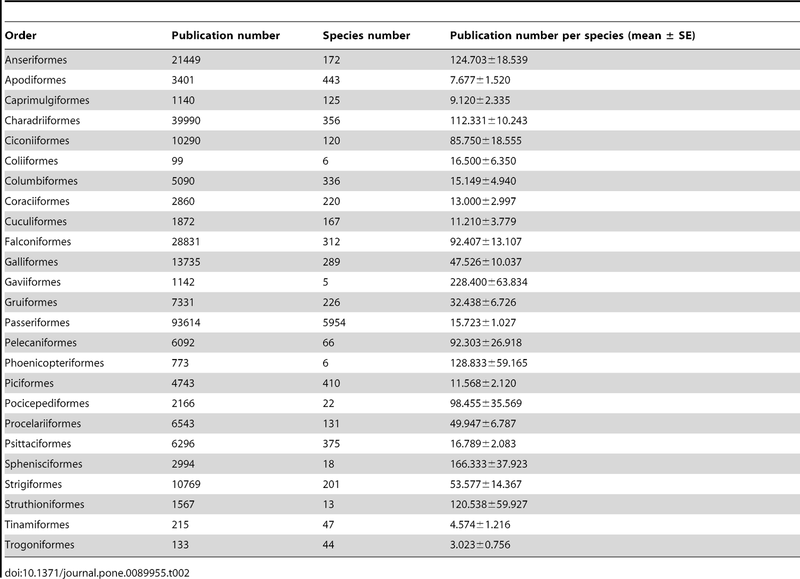 The full list of data they obtained is available in their supplementary files, including the following figure showing publications per bird Order. editions of the Zoological Record and varied from zero papers in 2217 species to more than 1500 papers each in species such as Sturnus vulgaris, Anas platyrhynchos, Falco peregrinus, Parus major, Passer domesticus and Larus argentatus. Estimation of research effort was made from searches of titles, keywords and abstracts, or exclusively with titles, and both gave similar estimates: the two search methods were highly correlated across our 200 randomly chosen species. As well as taxonomic bias, the authors also examined for bias that might be due to bird traits such as body mass, clutch size, population size, habitat breadth, generation length, and distribution range.